Löschenkohl produced a second copper engraved deck, the Botanical Playing Cards, in 1806. 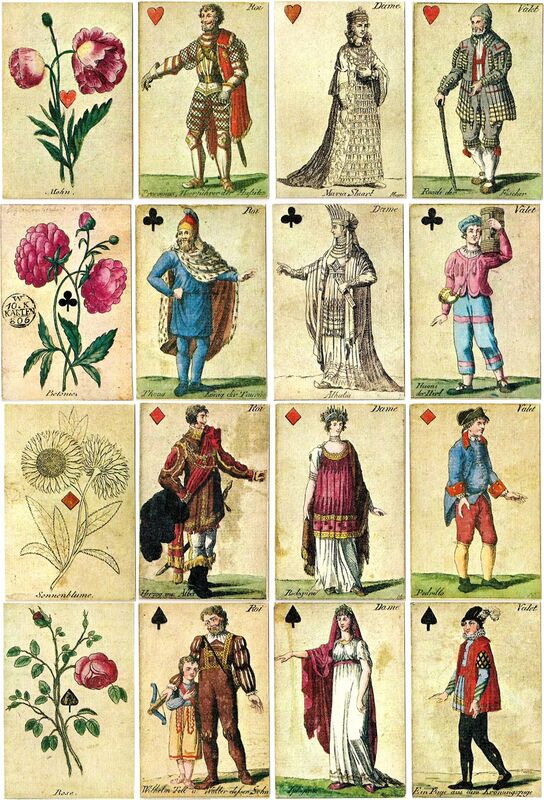 This deck, as well as the Musical Playing Cards, were produced shortly before Löschenkohl’s death and in regard to the Botanical deck, other Viennese card makers took legal action that resulted in an injunction by the court against its publication. As a result, only three copies of the deck are known to exist. Two are un-coloured and one is coloured but is missing six cards. In 1978 Piatnik issued a numbered facsimile of the deck. It was produced by permission of the Austrian Museum of Applied Art, which holds the coloured deck with the missing six cards. Piatnik also obtained permission to reproduce the six missing cards from an uncoloured deck, thus completing the facsimile edition. Above: Johann Hieronymus Löschenkohl's Botanical Playing Cards, originally published in 1806. The court cards depict full-length figures of famous personages. The Ace of Clubs has a feint inscription at the top: "Chez Löschenkohl à Vienne, 1806." The uncoloured deck is part of the collection of the United States Playing Card Company. Images from the facsimile edition courtesy Rod Starling.